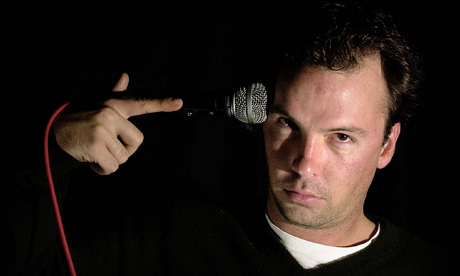 Doug Stanhope is a true representation of a no-holds-barred comedian – he’s unafraid to tackle the subjects that many performers consider too dangerous to touch, like abortion, paedophilia and drugs. What makes him really stand out however is the way he puts his own personal stories into his set, drawing the audience in before hitting them straight between the eyes with his most frank thoughts and confessions. Wherever he goes, he attracts controversy, and the last time he played Ireland, he created quite a stir. Aoife Barry finds out more. “I’m getting fat, enjoying my couch way too much. Everyone that I yell about in my act, I’m becoming, or have always been.” Doug Stanhope is ruminating on why he no longer likes long-haul touring. He’s currently driving home, a new television on the backseat that he says is for his mother who has just six months to live. It’s early afternoon and he’s crossing the Mexican border. “I’m a soft in the middle, doughy, fat American who loves having too many channels of High-Definition,” laughs the 41 year old, spewing out the words animatedly. “It’s kind of always been that way – when I say ‘you people’ in my act, I’m half the time talking about myself. My act is a public berating of myself.” But if the uninitiated think this public berating is a way of releasing his inner demons on an unsuspecting audience, think again – that’s not the way Doug (who’s often compared to Bill Hicks) does things. “I think getting it out is misinterpreted – that sounds like it’s being released, when it’s not,” he says. “It’s just a public humiliation of myself, but it’s not getting it off my chest at all. It’s still on my chest, like a rash.” It sounds like it’s the type of rash that he relishes to itch. After so long in the industry, how does he approach writing material? Like everything in Doug’s life, it’s done in his own inimitable way. “I desperately go like a drug addict, trying to find anything new to talk about,” he laughs. “You know, ‘I hope the cab driver hits that guy on the cross walk so I have something to talk about tonight’. “ He laughs again, the laugh of a man unconcerned about doing things the traditional route. “I take notes, cryptic notes if the inspiration strikes and I’m nowhere near the stage and I’m off the road, but usually yeah, I cram for the exam,” he elaborates. On stage, it never feels as though Stanhope is searching for something to say – he’s a quick-fire, quick-witted comedian, who looks like he thinks on his feet. “Some of it is intentional, but a lot of it is just trying to remember – it sounds like I’m just coming up with it because I’m trying to remember what I just wrote down earlier to say!” he guffaws. But does he worry about offending people? Surely talking about bringing your girlfriend for an abortion, or tracking paedophiles over the internet is not going to go down smoothly with the entire audience. “I never worry about offending people, but I always worry about boring people,” he deadpans. Last year, Stanhope decided to make things even more interesting for himself – by running for President of the United States. Despite being a serious project, it didn’t quite turn out the way he had planned. He explains: “It was something different, and something I could sink my teeth into creatively – and it turned into such a boondoggle of red tape and really scary paperwork.” He sighs. “If you screw up just a little in the reporting of your finances, you can get six-figure fines. I screw up way too much to be able to afford [that].” He also discovered that anytime he talked about the campaign onstage, the proceeds would be considered campaign contributions. “It turned into something where I could have been f**ked a thousand different ways…and I’m not that passionate about this country,” he says dryly. But it hasn’t left him with a sour taste in his mouth – instead, he’s left with mountains of ‘Stanhope 08’ merchandise to shift.